OH farmer, it’s the most wonderful time of the year! No, no not Christmas…BACK TO SCHOOL! Don’t get me wrong, I love the kids but it is time for them to go back to school! 1. It’s been a crazy non-stop summer! Me and Jerry are EXHAUSTED! That’s why we’ve planned the perfect day to celebrate…right after we help Granny with the crops. 2. PERFECT! Darryl and Tasha have gone to school, time for us to catch a breather. We’re at the park to do some relaxing Yoga under the big California Lilac tree. 3. 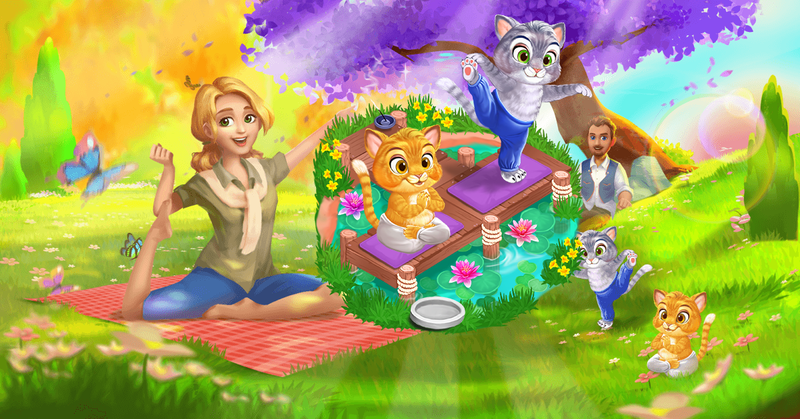 Ahhh, peace and quiet at last…just me and Jerry, in the great outdoors, smelling the beautiful California Lilac blossoms, gettin’ our Yoga stretch on! Pure bliss! 4. OH! I almost forgot, I packed some lunch for Jerry and I, it’s all in my bag and actually, I think my phone is ringing but who could be calling NOW? Hello? Darryl? 5. Oh no! Darryl is sick and needs to be picked up from school! So much for me and Jerry’s day of zen! I guess we better pack up our food and go get him. 6. Well it’s kind of getting chilly out here anyway, good thing I brought a sweater…Oopsies, my phone is ringing again…what could’ve happen now? Hello? It’s Darryl again! 7. He called back to say he was just joking; he’s not really sick, that little prankster...BUT he also called back to tell us about a sweet surprise from him and Tasha. 8. They knew we’d be in the park today so they hid a special gift here for us. Aw, it’s been right above us the whole time; it’s a beautiful picnic basket. Those sweet kids! Page generation time 0.0354 sek.